Scholarship Programs - The National Board of the ROCKS, Inc. 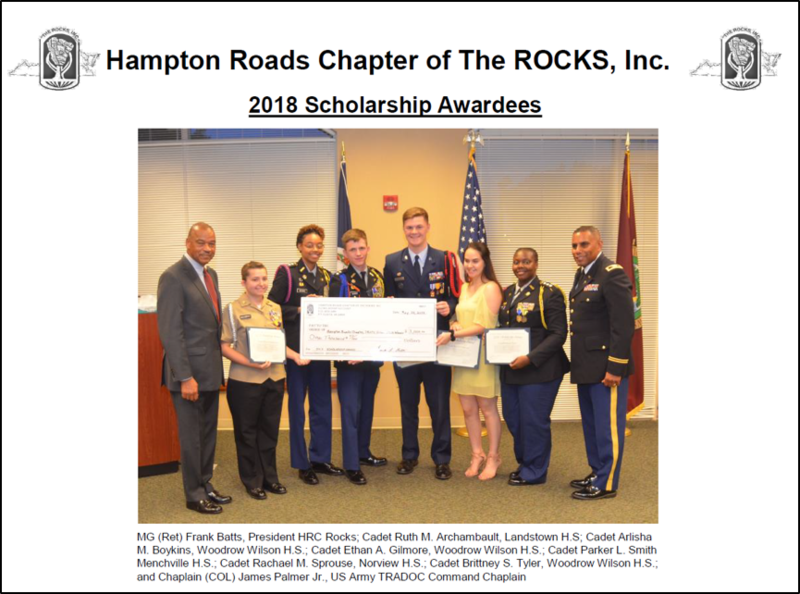 The Hampton Roads Chapter of ROCKS, Inc. promotes officership, mentorship, and counseling from the time of pre-commissioning (cadets) to post transition (retirees). One of our Chapter’s annual goals is to provide assistance in the form of Scholarships to help deserving students who are participating in any service JROTC program to go on to a four year college and continue their military and civilian education in a Senior ROTC program. Educating and mentoring the future leaders of the US Military is a costly endeavor. So we implore all current members, former ROCKS members, current national members from the Hampton Roads region and other corporate donors to consider making a contribution to future military leaders hailing from the Hampton Roads, VA area. Applicants must be a high school senior currently enrolled in a local JROTC program at the time of the application. Must have a desire to be an officer in the US Armed Forces. Complete a HRC ROCKS, Inc Scholarship Application. Submit a SAT or ACT score. Write a one-page essay on "Why I want to become an Officer in the US Military." Submit 2 letters of recommendation, with one from the applicable Senior Military Instructor. Submit the required aforementioned documents to arrive no later than the established date. The HRC ROCKS will choose winners from the seven cities that make up the Hampton Roads Region. Students may choose to attend any college with a ROTC program. Our chapter provides scholarships of $1,000.00. A donation of $ 1,000 will provide one HRC Scholarship. $1,000, $500, $100, and $50 will make a significant impact on our goal of providing up to 5 scholarships this year. To provide a material donation for the Scholarship Fund or Scholarship Fundraising Event(s) for the 2016-2017 school year, please contact Mr. Dave Glover at davide.glover@hamptonu.edu for mailing and delivery information. Thank you for your gift to help a future Officer succeed through education. For HRC ROCKS Website assistance and/or to provide feedback and updates, please contact Toney C. Mooney at tcmooney@cox.net.